Deer Meat, Pretty Girls and The Ghost Women. It seems to me that family traditions are become fewer and fewer with each year. We talk less, spend time together less and often it is too late when we realize we needed information that has already slipped away. So to prevent that from happening today my husband and I spent the day teaching two of my younger girl friends the art of skinning, quartering and cutting up a deer to make into venison burger. 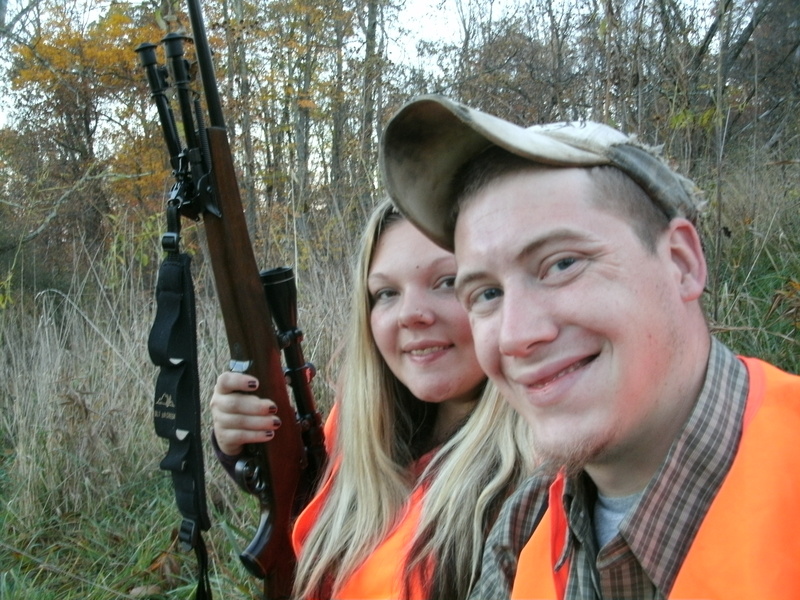 So when Danielle and Samantha asked me about our life style here in West Virginia, hunting and deer processing came up. They both asked if they could learn more about butchering and how we prepare the meat that we hunt. It was a wonderful day of being outside spending time with two pretty girls and my husband. So the morning started with the 4 of us in the garage with a nice buck hung and ready to skin. The process is easier when the deer is still warm but with this deer we wanted to the girls to help learn the process from the beginning. Tom took time to explain the steps needed to cut through the skin and the processes of pulling the hide down over the body to the head of the deer. Each girl taking turns pulling and tugging. 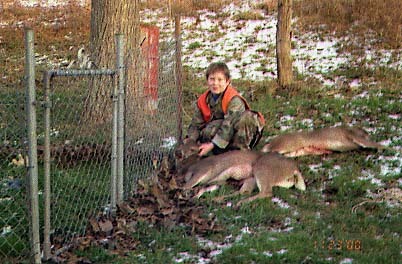 Then he showed each girl how the quart the deer and cutting off anything we don’t butcher. Slowly, we moved the quartered pieces into the house to be cut up and ground into burger. Each took a cutting board and knife and begin to talk about the different cuts of meat that people use. We made roasts and talked about stake and stew meat. We talked about our favorite ways to make jerky and what people do to cut the “gameness” of venison. 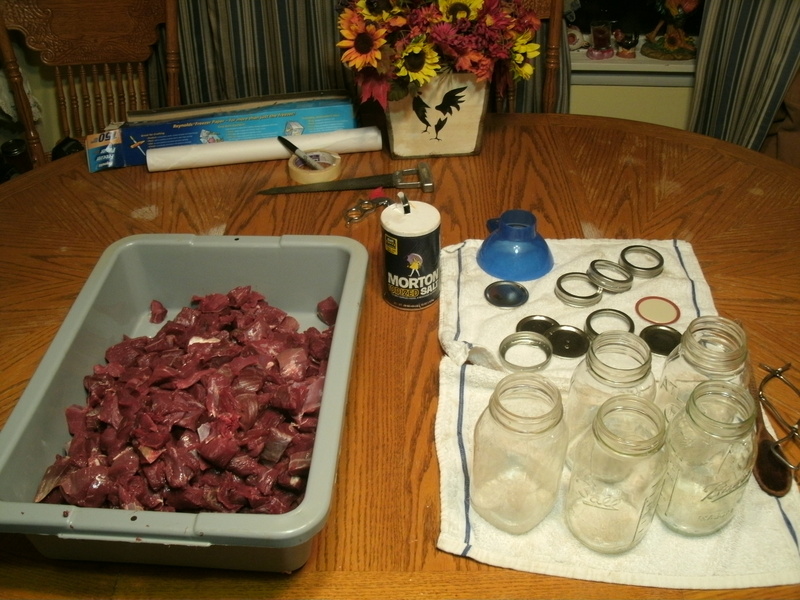 We eventually had a tub full of venison chunks that would be ready to grind in a few minutes. As we talked, laughed and told stories I had the distinct feeling of the past coming to life. As if generations of women were watching us and reflecting on our work. A tribe of woman from Danielle’s Alaska, a group of farm woman from Samantha’s Ohio and a group of homesteading woman from my West Virginia, all crowd around us in spirit. They whispered their comments, talking about how they once smoked, canned, dried and froze the meats that men and boys brought home. How they took pride in their work and how hunting and butchering were shared activities in families. How no one was left out, everyone was expected to help in providing for the long winter months. As we break for lunch, I make a pot of venison barley soup and thin slices of tenderloin fried until brown for steak sandwiches. We eat together and talked about our homes, fulling our bodies with the goodness that our hard work produced. The ghost women of the past seem satisfied with our skills for today. They know that their grandchildren have learned some of the skills that kept generations of our ancestors alive. Lessons that the ghost women are happy that we are sharing. Tom takes time to help with the grinding as I stuff it into bags. We feel the ghost women retreat, they shower their blessings on my family and home as they fade away. I take the bags to the freezer and close the lid. I stop in the gray light of the basement and say a prayer of thanksgiving to all of those who have helped me on my way to becoming one of the keepers of this knowledge and a woman of the woods. It is not often in the modern world we are asked to share our traditions with others. So, I was so happy to have these two pretty girls come and spend a day with me learning a skill that I have repeated a hundred times over the years. It was wonderful sharing my life with people who want to learn about it and want to be in some way a woman of the woods also. No matter how you stand on the issue of hunting/trapping it seems to take a different tone in rural places where farming is a way of life and predator hunting is seen as a vital part of protection for livestock. 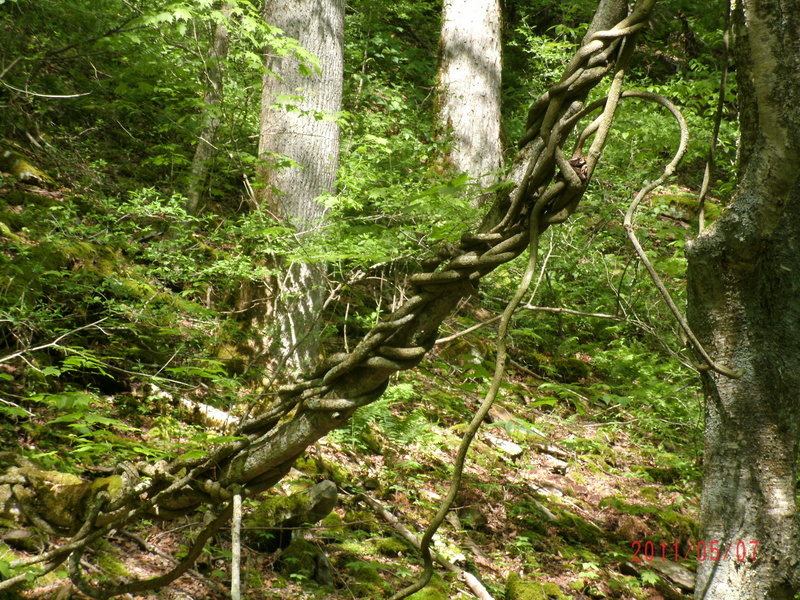 West Virginia like many eastern states is seeing an invasion of a new kind of predator. The Coyote is a relatively new member to the Appalachian ecosystem as migration of the Eastern Coyote ( a cross bred coyote and wolf) has taken generations to happen. But the population is growing and more people are discovering what western folks have always known. No one wants a Coyote in the chicken house! So what to do with the increasing populations of non-native predators in our state? It is a challenging to be a farmer or rancher to start with, but to hear the yipping and howling of a pack of Coyotes from the front porch of your farm can be unnerving. Over the 18 years that we lived and worked our farm Coyotes were only in our area the last 6 to 8 years. It was often in the fall and winter that we heard the late night howling of the dogs. Often it was during the early spring foaling season on the farm and same time of the year that our neighbors cattle were calving out in the pasture. By the end of February and March we would often see our friends out tending to the new-born calves and would meet along a fence row and talk about the winter weather and how the babies were growing. Often Tom and I would hear about the calves that were killed by Coyotes. It is tragic but one new born calf is no match for 3 or 4 Coyotes. Even today we often spend time with farmers who raise sheep and goats who have purchased “watch animals” like Donkeys to protect the herd from the preying eyes of the dogs. The Coyote topic is becoming more common in my circle of friends. No farmer wants to lose his income to a predator. Losing one calf is a real financial blow to a farmer. So hunting the mysterious animal is becoming big sport in the hills and hallows. Within a 50 mile radius of our home there are 3 Coyote hunting contests every winter. Coyotes are legal game year around and electronic calls and artificial light or night vision hunting is legal from Jan to July. There are no bag limits, daily,seasonally or annually. So all a person needs is to hold a legal West Virginia hunting / trapping license to pursue a Coyote. Even with this liberal policy the Coyote population is growning and the conflict continues to rise. So this fall as my husband and son were out deer hunting they watched a pack of three coyote running through the woods chasing a doe deer. It was a within a five-minute walk to a friend’s house where they roamed. They were close enough that if you walked your dog you may be confronted with them. I was shocked even after hearing them in the darkness night after night to think that they were hunting so close to our families farm and even closer to our nieghbors house. What would you do? What will most of the rural farm families do when this happens to them? When is wild life to close for comfort? Do we need to lose life stock and small pets before it is allowable to remove the threat? The need to answer these questions are being raised in West Virginia, Pennsylvanian and Virginia.The Department of Wild Life of West Virginia says it is OK to protect and defend, so my husband felt that it was in the best interest of that doe and my neighbors dogs and cats to harvest two of the three Coyotes that day. I sit here and wonder if the Coyote will be to West Virginia and Pennsylvanian what the wild boar is to Florida and Georgia. An animal that causes more damage than good in the ecosystem and ends up on the front page of the DRN’s list of problems. I know for now that with the help of hunters and trappers we may have a chance to keep the Coyote out of the chicken house but we may need more professional help like Florida and Georgia have resorted to for their pig problems. What the future holds for farmers and Coyotes is unknown but I do know that the problem is not going away any time soon. Deer season started today, so to honor my husband and all the wild game he provides for my family, I made this wonderful venison meal. I love to cook with wild foods and two of my favorites are Venison and Wild mushrooms. I had a few pounds of ground venison in the freezer from last year and about a pound of frozen wild mushroom from summer.The mushroom I am using is a Chicken Mushrooms ( Laetiporus- Cincinnatus) the orange verity. I also had home-made Marinara sauce out of the garden. All that I needed from the store was cheese and noodles. This was the foraged mushroom that I had a portion of frozen. The stems of the mushroom can be woody, I saute’ them chopped in butter with a little onion and garlic before I brown my meat. It can take several minutes to make the mushroom stems soft. I like to use bigger pieces so they do not lose their texture in the cheese mixture. I cook the mushroom mixture a little longer then what it takes to soften the onions. Set it aside to wait assembly of the lasagna. 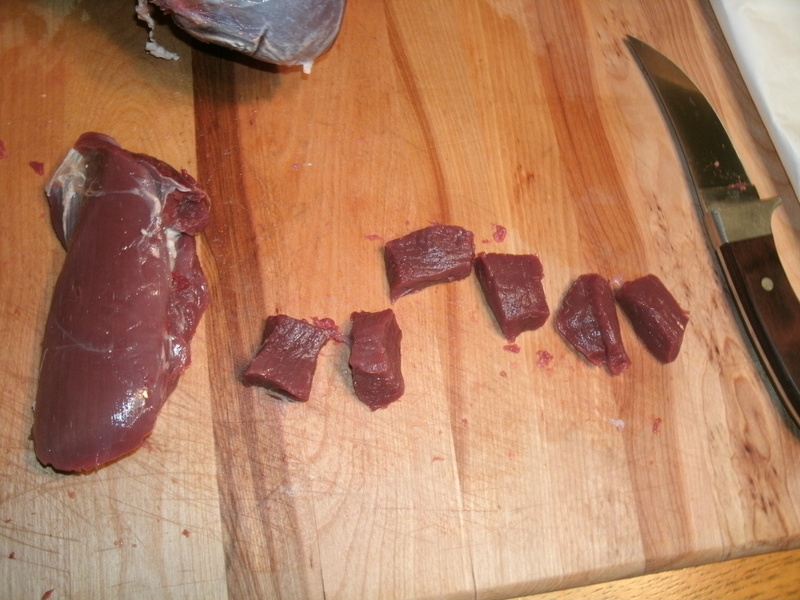 I then brown about a pound of ground venison with a little oil to keep it from sticking to the pan. Because Venison is so low in fat the moister you see in the photo is not oil but moister from the meat. It will cook off and I add Salt and little pepper and one quart home-made Marinara Sauce or your favorite sauce. Adding 1/2 cup water to store-bought sauce or 1 cup to my thick sauce to add the additional moister for Oven Ready Noodles. If you use regular cooked noodles you would skip the water. Then mix together in a large bowl the Cheese mixture of your choice. I like ricotta cheese in my lasagna for two reasons. First it has a lower moister content and will not get really runny with the Oven Ready Noodles. Secondly the flavor to me is better when mixed with Italian seasonings. Then add sauce to venison and place about 1/2 cup in bottom of 13 X 11 pan cover with uncooked noodles. I then top this with another row of Oven Ready Noodles and cover the top with more venison sauce topping that with mozzarella and Parmesan cheese. Back in the oven lightly covered at 350 degrees for 60 minutes and let stand at least 15 minutes after removing from the oven. This allows the cheese to set up while cooling and keeps the lasagna firmer when cut and not too hot to eat. Saute chopped mushrooms, onions and garlic in butter a minute or two more than when the onion becomes translucent. Brown 1 pound of venison in large skillet, add salt and pepper and 1 quart of Marinara Sauce. Simmer until warm and bubbly. In a 13 X 11 backing pan spread 1/2 to 3/4 cup meat sauce in bottom of pan, making sure to cover entire bottom of pan adding more if needed. Cover sauce with one layer of Oven Ready Noodles. In large bowel add all but a handful of cheeses. Ricotta, Mozzarella, Parmesan, and two eggs. Mix until mixture is smooth and creamy. Add Italian seasoning, parsley, garlic salt to cheeses and mix. Scoop cheese mixture over Oven Ready Noodles and smooth out. Cover cheese with mushroom and onion mixture, spread evenly cover with 1/2 cup sauce below noodles. Cover with another row of Oven Ready Noodles and top with sauce, topping with left over cheese. 10.Cover loosely with tin foil and bake for 1 hour at 350 degrees. Let cool for about 15 minutes before serving. So with high hopes I can fill my freezer again this year with fresh organic meat..best of lucky Tom, Cody and Bill may you hunting season be filled with the joy of nature and thrill of the hunt and the knowledge that you have provided another year of food for your families. 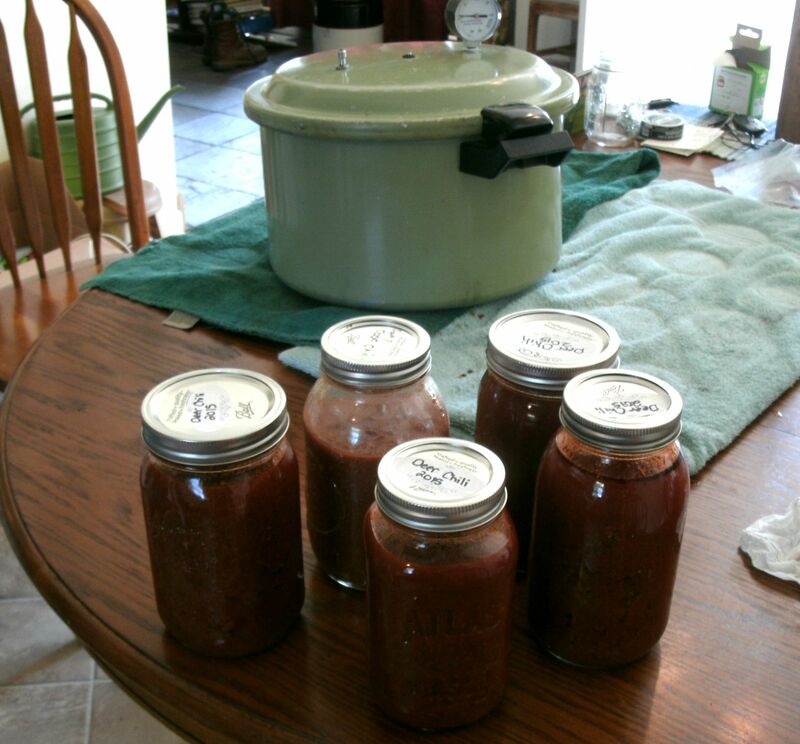 Grandpa’s Home Canned Venison Chili Sauce, made from the garden. When trying to live closer to the land many families turn to hunting, fishing and home gardens. In our families case we do all three, letting nothing that comes our way go to wast. Canning venison chili Sauce is a great way to use up extra produce in the garden and take a little of last years deer burger and make it into an on the go meal for those cold winter months still to come. This Labor Day weekend my family made about 13 quarts of this chili starter in about 6 hours. Each quart of sauce when added to one large can of kidney beans will make 5 to 6 servings of home-made goodness. We started with only one problem, my tomato plants blighted this year. I have only one remaining tomato plant and we had to buy the two quarts of juice this recipe calls for. In better years I have made tomato juice and added some Tabasco sauce for the bite we love in our chili. So instead this year we bought two bottles of V-8 ( one hot and one regular) to fill the needed juice in this recipe. I used the current Ball “Blue Book, Guide to Preserving” as our guide for processing times and head space for making our meat sauce base. Any ground meat including venison should be processed for 1 hour and 15 minutes with chili needing a 1 inch head space. We then used grandpa’s recipe for the broth portion of the chili and added the recommended 5 pounds of ground venison. This resulted in 6 quarts of what my family knows as Grandpa’s venison chili and it is a family favorite. My kitchen smelled soooo good for most of the day because of the fresh ingredients from my garden like hot peppers and garlic. 3 cups tomato paste or 4 small cans. this makes 6 to 6 1/2 quarts of canned chili. In a large 8 quart stock pot add oil, onions and garlic. Saute’ until onions are beginning to soften and add ground venison. Brown all 5 pounds over mid heat with onion and garlic. Once the meat is cook add juice and all remaining ingredients. Simmer for about ten minutes string often to prevent sticking and making sure all the ingredients mix thoroughly. Bring chili to a boil and ladle into clean, sterile, quart mason jars leaving 1 inch of head space. After cleaning any spills off top lip of jar, top with clean sterile lids and rings that are just tightened. 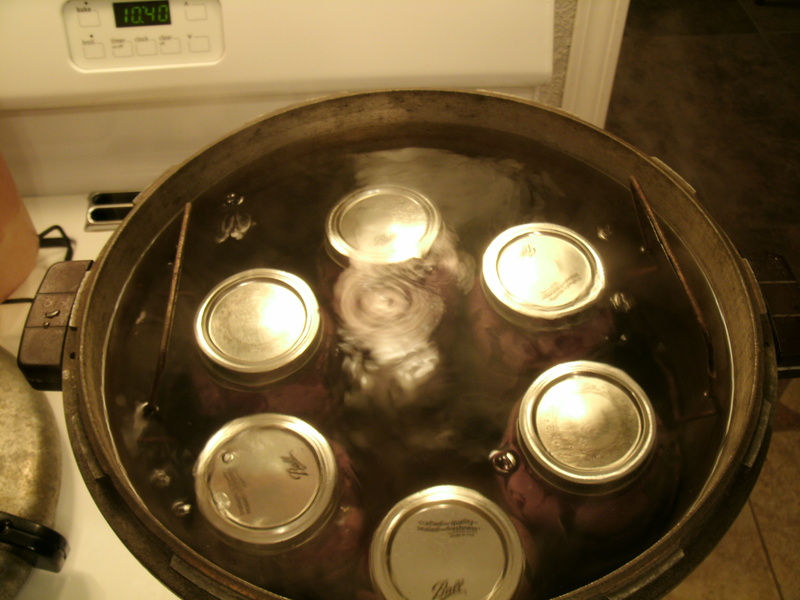 Place in pressure canner with simmering water ( amounts vary) and add lid and begin to process after ten minutes of steam has escaped the canner. Process jars for 1 hour 15 minutes at ten pounds pressure. 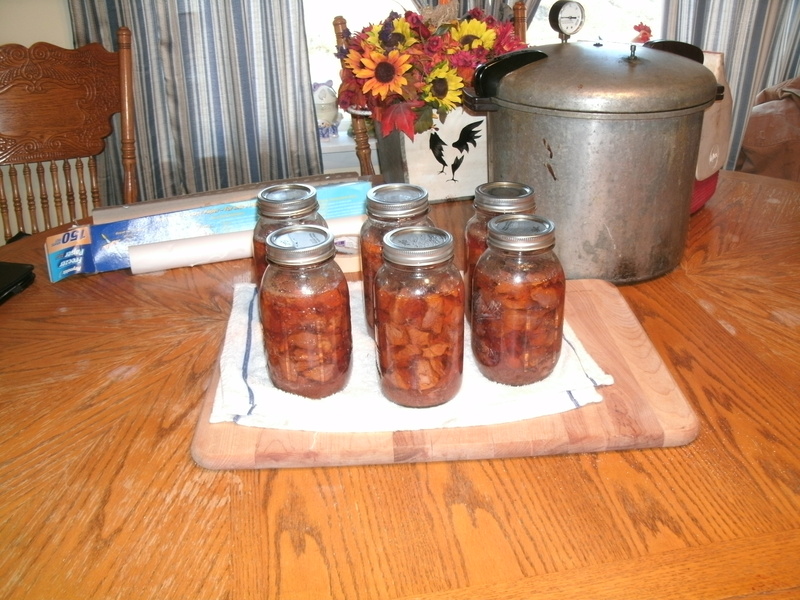 Remove hot jars from canner and set in a clean dry place to cool and you should hear the ping of the lids as they seal. 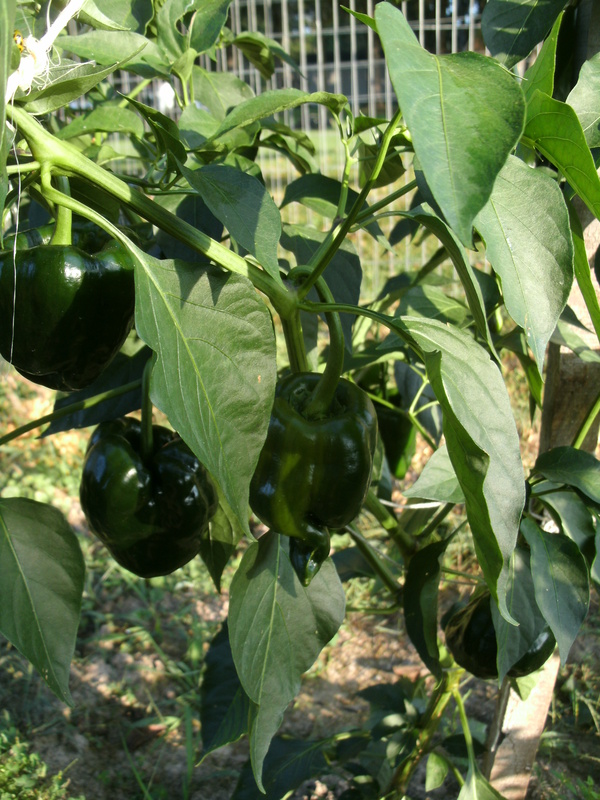 Eat any chili in unsealed jars with in a few days and store inside the refrigerator. The remaining jars that have sealed should be used within a year of processing and stored in a place that stays above freezing. Now all I need is a crisp cool day to enjoy this home-made chili. Happy Canning! A Gun Owning Woman and my Freedom of Speech. I am a gun owner and if that is a problem then you do not need to read the rest of this. 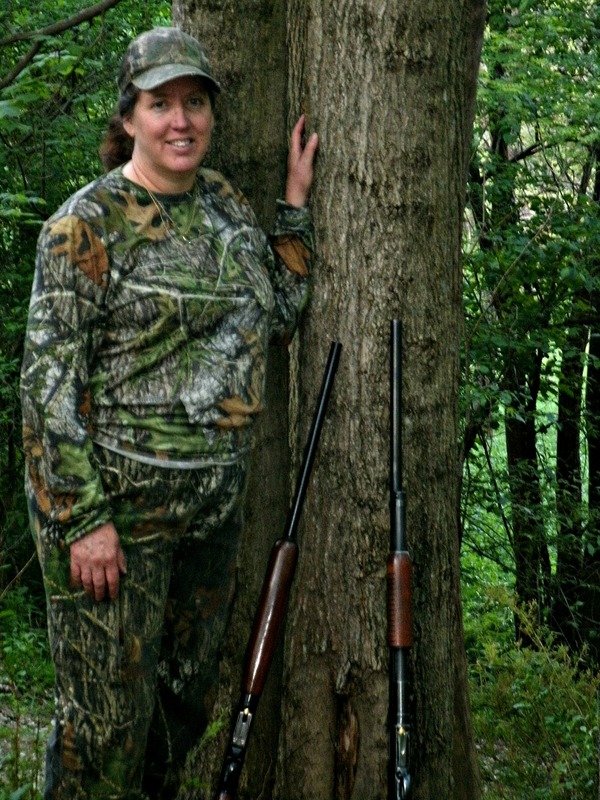 I am a sports woman who loves to head to the range with my family, loves to hunt wild game and is a supporter of my local college riffle team. I married a man who reloads his own ammunition and has a back ground in both law enforcement and the military. Guns are a part of who we are and what we do for fun. The point is that soon I and thousands of other Bloggers, Writers, Website designers, may lose the right of ” Freedom of Speech”. If what I read today is true,( the Washington Examiner shared this article) my blog post about my husbands reloading bench,our hunting trip, the information I could share on how being a better marksman or any conversation about guns I have with you my readers could be censured. I am also worried as a sports person,that I could not write about the specifics about the gun related things we do. In the future I could be fined or sent to jail….. (send me please) for just doing what I love. The penalty for sharing gun and ammunition information over the internet is a fine up to 1 million dollars and 20 years in jail. I worry that when I have a moving post on a topic that is legal and informative, I will be unable to share it, unless the government has a look at it first. Hummm, are any of you feeling like we have moved to a police state here, the results for the general population will be terrible. I am fully aware that our country is divided on the gun subject. It is a hard subject to debate for those who do not own a weapon of any kind. At first this regulation might appear that the government is only taking the larger public’s safety into account ( I have my reservations about that). But I argue that a lack of information is more dangerous than anything a Gunsmith or Ammunition company can share on the internet. If we as a population can not share ideas, we allow a few to control our future, a future that will always be controlled by people who know weapons. I want you and I to have the right to send out information about hunting, gunsmithing, reloading, crime and safety. I want these topics debated openly. I have the right to share what we are doing as much as you have the right to NOT READ IT. 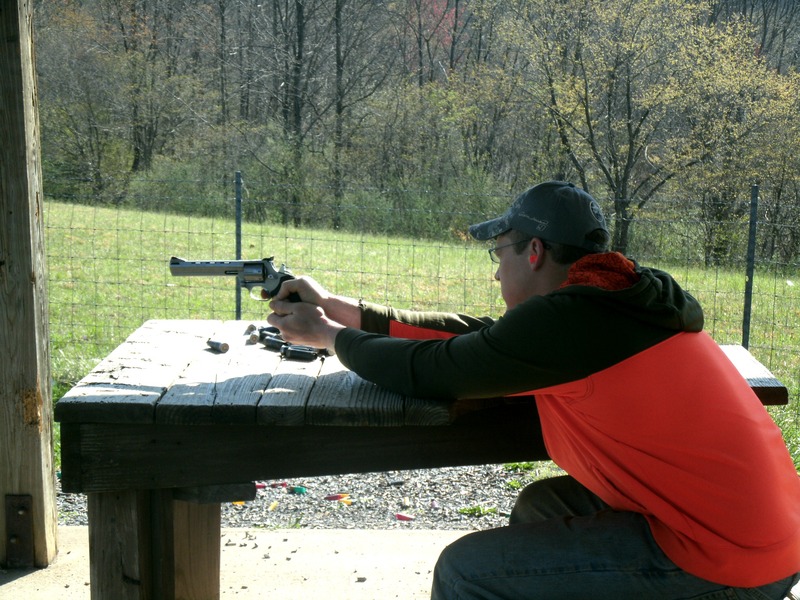 I want to share what my WVU riffle team is doing and what their Olympic competitor coach is teaching. I want to share the pages from an antique survival manual that shows how to safely use a .22 riffle. I want to tell you about my friend, whose husband got killed, during Turkey Season shooting accident and how it avoid it. If what the above artificial states is true, then my friends you and I will not have the freedom to talk about school shootings or about how to safely clean a pistol. The idea of protecting the innocent from information that could be used in terrorism is a failed argument. If we are only going to control the information on the internet what is the point… Books have long taught the skills to kill, hunt, reload and build weapons of many kinds. Long before the internet my nephew blew his hand off with a pipe bomb at 14. Where did he learn about the idea ….. movies. If he had been lucky enough to have better supervision in his life he would have never attempted to build what he looked up for free in a book from the library. At 14 he could have used that weapon to kill many and never once looked on the internet for the information. If this is what the government thinks may stop terrorism, I am very worried about our leaders. Is the public so ignorant to believe that terrorists from middle eastern countries find all of their information on legal American fire arm company websites or blog posts from people like me or even ammunition manufacture Face Book pages. I bet not… but maybe this is the way the government plans to stop the bloggers from writing about the facts about gun ownership, repair and uses, punish the whole because of the few radical writers. Again it is a sad state that I am even worried about this topic. 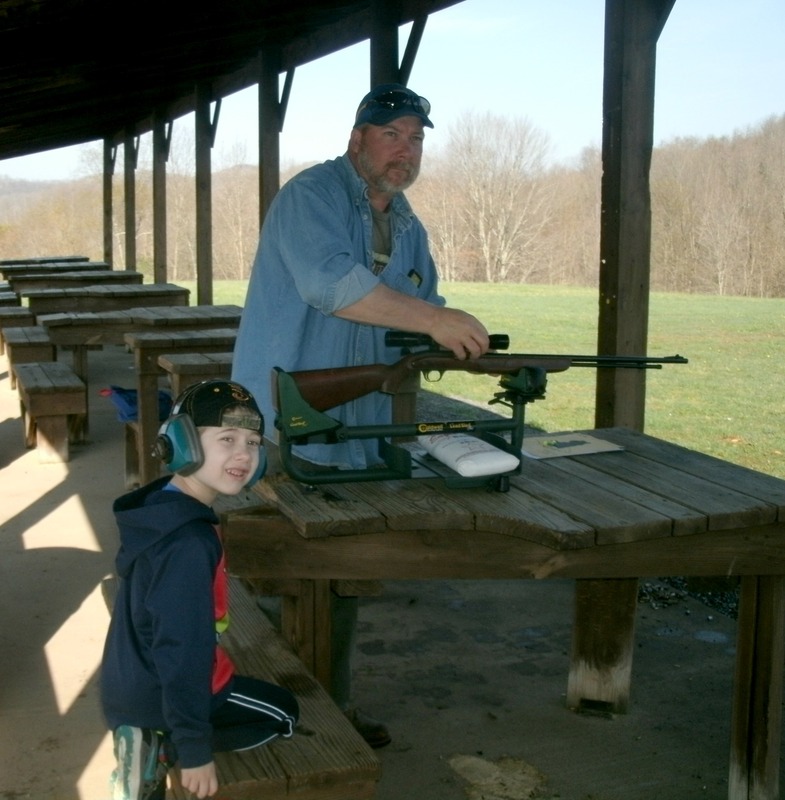 I love my way of life, I love sharing it, but when my husband decides that he wants to update an antique riffle for my son to use for hunting, I want the right to tell you about it. If the government is so worried about the information that we openly share and are planing to stop the education of its citizens, we are on a very slippery slope, my friends. If I have to ask my government permission to give you information that one day may save your life or a life of your neighbors, I think we are going to wish some one had stopped the government from stepping on the “Freedom of Speech” and if we are lucky our “Freedom to Bear Arms” too. 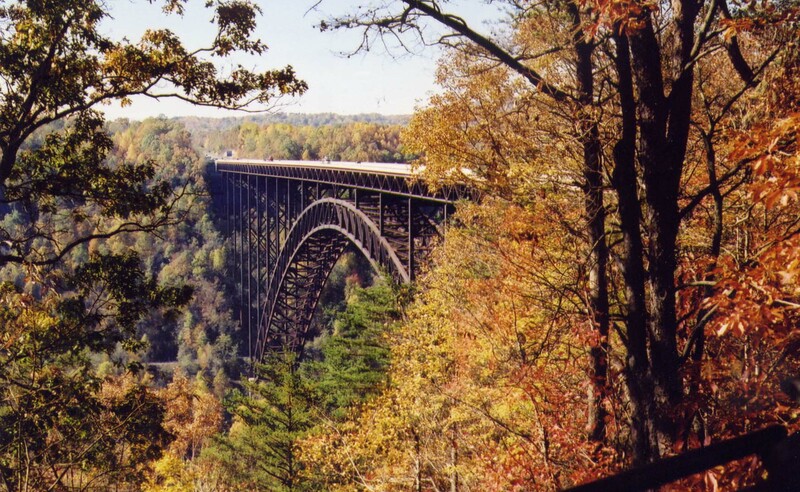 A fellow blogger, Dan Wall at Northeirthanthou.com and his Alaska blog, has gotten me thinking that maybe I have become a true native of West Virginia if only for the fact that I have fallen deeply line with what he calls “Native Time”. He recently brought up the topic in a post about how the native people of Alaska have a slower, less formal passage of time. I have had this same experience when I moved to West Virginia. I lived on Boulder/Denver time and was always on the look out for some thing different and exciting to do. I was rushing from work to the next party or shopping trip or concert. Then I moved and experienced what I will call “Mountain Time” I know there are other places all over the country that fall into this “Mountain Time” description. It seems that here in the “Mountain State” the feeling does not end when you head to town. Things here just make you slow down. I think much like other mountain communities is starts with the terrain and lack of basic services. You must understand that when I moved here in the early 1992 I had neighbors who did not have in door pluming. My husband did not have cell service while driving major interstate highways. We lived with out power for two weeks almost every winter and no one really complained or ran to town looking for a hotel. We drank well water and melted snow for washing dishes when the pump went out. These living conditions are typical for thousands and thousands of people who live in the rural areas of our state. When you live out of cell service and you internet is still dial-up in 2015. You just live to far from town to not live slower.When getting out of your driveway in winter takes two or three days, you are on “Mountain Time”. The people of West Virginia have learned by living in this rough environment that just a simple task can become a monumental challenge. For example, my experience with the BarnWood Builders lost the production company money. In the end, the barn wood that I now have at my house was to hard to truck out of the hollow where the barn sat. The producers tried in vain to hire a tractor-trailer to haul the wood out and not a single company would take a truck with in 8 miles of the barn. There was no where a truck that size could turn around, there was no place to park a truck unless blocking the gravel road. So unless the wood got sold to, or given to, families like mine who have pick up trucks and strong backs, the wood was out of reach. In the end the majority of the wood from the barn burned on site, it was just too much work getting it out. It just takes more time to do everything when you are living in terrain like this. Nothing is flat, everything grows some kind of poisons vine or is topped with a huge tree. The creeks flood and rivers are too deep to drive through. I also think that part of “Mountain Time” is that people who generally live a hunter/ gather/ agrarian life styles have a broader picture of time. They look at their lives as part of the a seasonal plan rather than a monthly or day-to-day plan. When you are look at how crops are grow…(really think about how slow plants grow) your mind is not focused on today or tomorrow but what will happen in three weeks. If you are a hunter or trapper it could take months to harvests your game and you are look forward in 3 month jumps of time. Then when the work needs done you still have to fallow what the seasons allow you to do. It is a system that works very in tune with the weather and seasons. In the heat of an August day you would never expect a West Virginia farmer to attend an afternoon meeting… He is busy getting his hay or corn in. He will work his fields until 7 or 8 at night. You would never expect my husband home for a mid day meal during deer season. He has spent hours hiking into his favorite hunting spot and spent hours planing and tracking a buck. If I am lucky he will be home about an hour after dark around 6, if not later if a nice buck needs dragged home. I am never surprised any more when school is cancelled because of rain. I have had feet of water in my barns and driven through water that ran on the floor boards of our truck just to make sure my family and farm was safe.Tom and I have given aide to ATV riders who crash into trees or rolled over in the woods. Making a short horse trimming trip into an afternoon adventure as we waited for emergency responders to arrive for total strangers. It is all part of the experience and it all takes time… and usually it is not about the clock but being in the moment. So, if you are lucky to live on “Mountain Time” you will see Tom and I up at 4:30 tomorrow morning dressing for a morning of turkey hunting. We will then head home around 1 to a midday meal that we share once a week with my older sons family.Then if the weather allows we will be tiling and planting the garden until about 3 pm.Then naps and up again for dinner and tile work until 10 pm.This all depends on the turkey tomorrow… so who knows if my schedule will work out at all and if I will even be on time for any of it because I live on “Mountain Time”. I was born into a hunting family, I married into a hunting family and I am now raising my own little hunters. So if you find hunting or eating wild game offensive please skip this post. 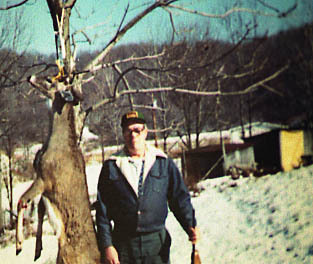 The hunting life style is a huge part of our everyday lives here in North Central West Virginia. Our family’s have hunted for wild game for generations. 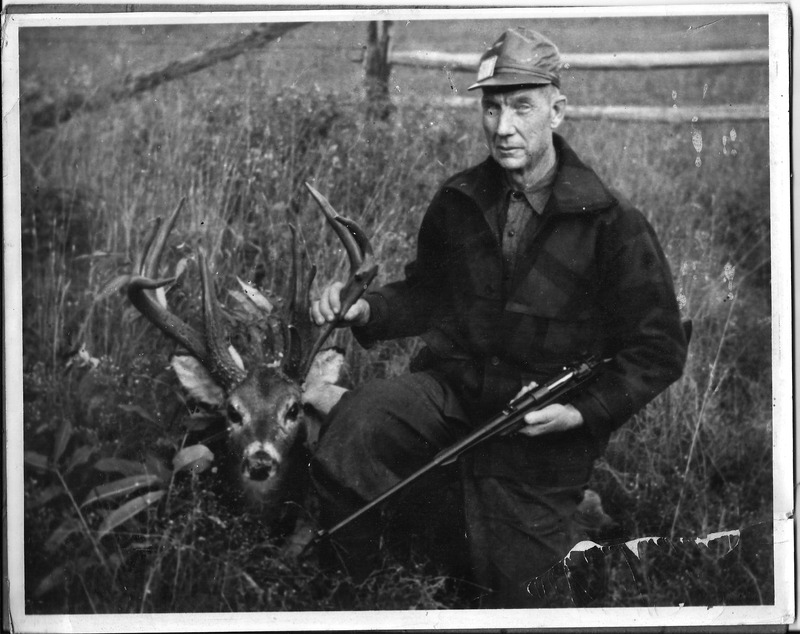 This is a wonderful photo of my husbands Grand Father with a 28 point buck that shot some time in the 1950’s in Randolph County West Virginia. My father on the other hand hunted for Elk and Mule deer in the mountains of Colorado. Both families eat what they hunted and were subsistence hunters. This was a way to feed their family’s through long cold winters and lower the cost of having sometimes 4 to 8 children. So hunting in my family today is less important to sustain our smaller families, but is still a deeply rooted part of who we are as people. It is on these cold dark November mornings that sometimes three and ever four generations gather together after working long hours all summer to find time to finally visit. In most cases the whole family gets involved in some way, some cook food for the hunters who roam in and out, some butcher, some hunt, some grind and pack but every one takes part in the opening of Deer Season. Tradition is that Grandma starts Grandpa’s coffee pot around 5:00 a.m. on opening morning. The sisters get chili on the stove for lunch and I wash knives clean grinders and get butcher paper out and get ready to butcher.The drive way slowly fills with trucks and SUV’s and at 5:45 a.m. just about everyone in the family besides the smallest children are up eating a hardy breakfast going over plans for the day. Before the death of my father-in-law mornings in the kitchen sometime warmed 10 people ready to head to the woods looking for a deer that was worth the effort of dragging home. In our family it is not only the men who hunt and my daughter in law and myself have hunted and learned the rules of safe hunting. We are not able to hunt as often as the men but we enjoy what time we can spend in the cool quite mountain air just like they do. The hunting sport is very adaptable for anyone who choose to have the experience. 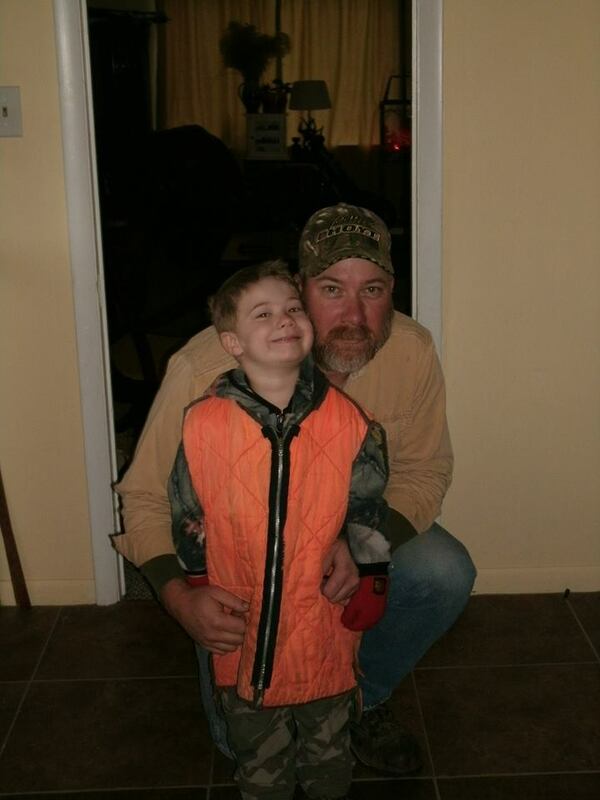 My son who is 6 will hunt with his dad this year although he is not allowed to kill any thing until he is 8 years old. I will hunt later in the year after the Thanksgiving rush is over and go muzzle-loader hunting in Dec. if my foot allows. My daughter in laws brother who is a paraplegic will hunt from his truck in a mountain meadow with a friend again this year. The people who enjoy the hunting experience are as different as any group but share one common believe. That hunting is a gift, that nature should be shared and protected. That the more time we are able to get back to our roots the better we are as people. Hunting teaches so many lessons that are rarely learned any place else. First is of course is gun safety and second is the lesson about life and death. It is in a hunters first kill that they discover the emotional and moral consequences of killing another being. There are many people who after that first kill discover that hunting is NOT EASY. 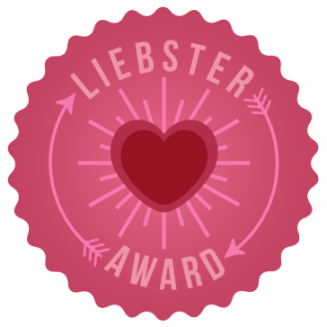 It is not a prideful experience and many people chose to never do it again. Then there are others who give thanks for what they have received from the earth and know that with the loss of one life, ours will continue. It is one of the only ways that a person can feel that they are truly part of the cycle of life. That you are a living part of nature, part of a system that is older than the human race. 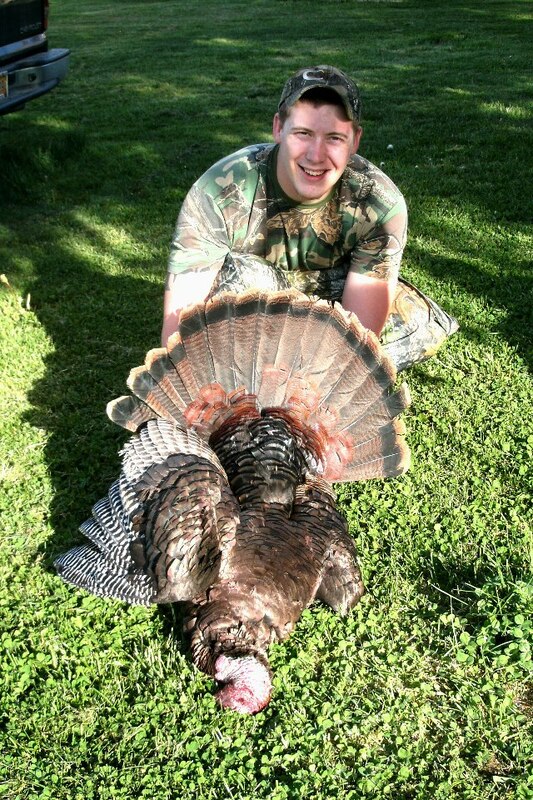 Cody at 22 years old with his 1st wild turkey. I know that there are bad people everywhere and the hunting community has their share. I can’t tell you that people do not poach wild animals, I can’t tell you that people don’t trophy hunt. I can’t tell you that people don’t get hurt while hunting, guns are dangerous and deadly. What I can tell you is this, that the time shared outside with a grandfather or grandmother is what teaches the next generation about the meaning of life. It is the connection from one generation to the next that forms a bond of education and respect. 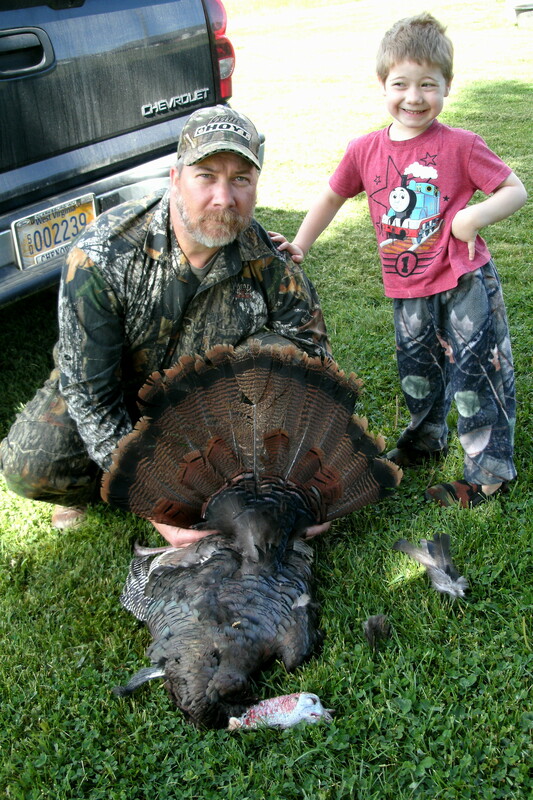 I want my sons and grandsons to have the same experiences and life lessons that my husband and I have had in the woods. It is from generations back that we teach others how to have respect for what the land gives to us. So as opening morning of deer season approaches the excitement builds. The guns get cleaned, the warm gloves are found, friends called and plans confirmed. 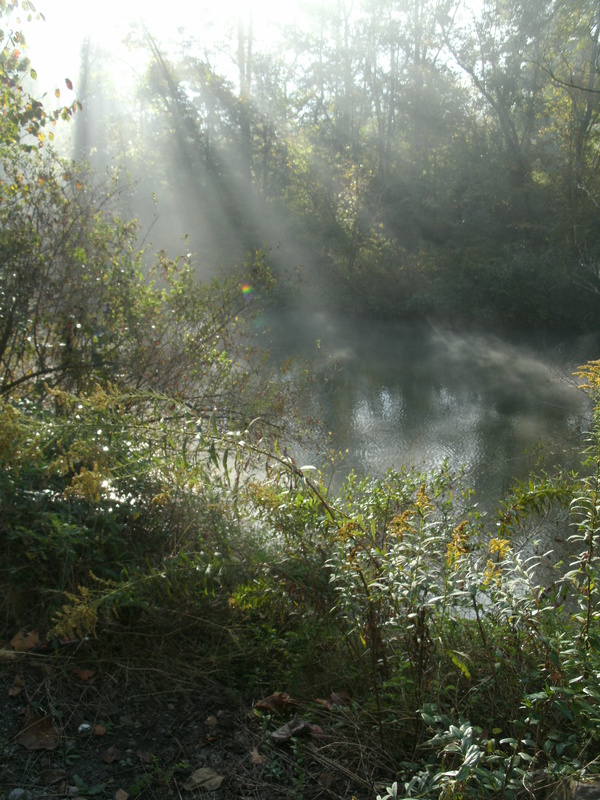 When dawn comes you experance a fall sunrise through the trees, watch steam rise from an icy pond, listening to chip monk chattering in the leaves and see hunting in a different way. It really isn’t about killing at all. It is about family and wild life and the glory of an early morning in the woods. As some of you already know my family lives as much as possible on the land that surrounds us and the bounty that God provides. This includes fall hunting for wild game and fishing as much as possible for our food. My problem has always been what to do with all the meat that the boys bring into me. Well of course we freeze a large portion of our meat and fish but three years ago we went with out electric for about 10 days and lost most of our families food. This brought up the conversation about going back to canning at least a portion of our meats so we would not lose all of our food again. My husbands family has cold packed canned deer and pork for over 40 years mostly because the quality of meat when it comes out of the jars is OUT STANDING. The high pressure and moister combine and make the most tender juicey meat. The only way to explain it is to think pulled pork that all you have to do is open the jar and pour out. We can deer meat for BBQ sandwiches and I make a wonderful deer tips with gravy out of. 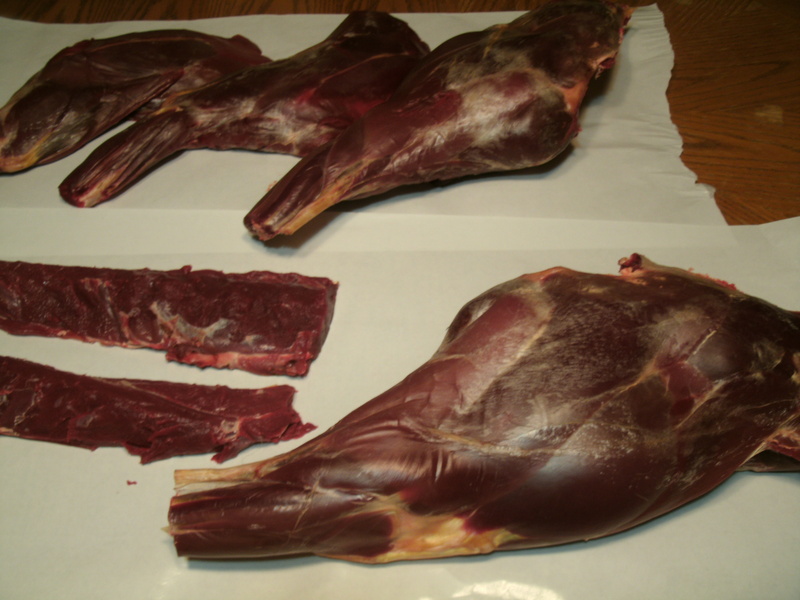 The meat is safely stored for two years and is easy to transport to hunting camps and on summer camping trips. The meat is already cooked, warm the contents and eat. 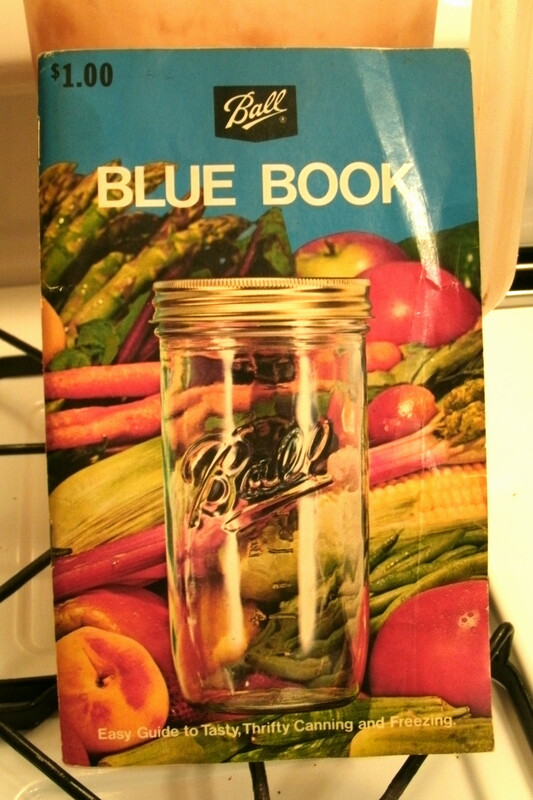 To start with I suggest that anyone wanting to learn more about the safety and processes of home canning get a good canning book like this one. Processing of meats MUST MUST MUST be done under presser so this process is not for those who use the boiling water bath method. Meat is very easy to process but the time involved is a little lengthy. The average time is 1:30 of cooking time so I plan about 4 to 5 hours from boneing out the deer to the end of the canning process. One nice size white tail deer will make about 7 quarts of cold packed stew meat. In this case I made 6 Jars and had about 11/2 lbs left over I wanted to use in another way. First, as always wash and sterilise your jars rings and lids, and look for chips or cracks in the jars.This defect will prevent the jars from sealing properly and spoil the meat or make a huge mess in the canner. I use quart jars and this will make about 4 portions of meat per jar. You can use pints and adjust the cooking time accordingly ( pints process for 1 hour 15 mintues). I start my canning preparations with washing everything down with a little bleach water that includes my cutting boards and knives and even the table where I am cutting the meat. We cover everything with butcher paper and get the meat ready to debone. We do not can the tenderloin pictured above left. They are tender enough on their own but the remaining steaks and roasts get processed. The only requirement is that the pieces of meat are about bite size and fit in the mouth of your jars easily. We try to remove any excess fat or connective tissues. Cold packing jars saves time but the meat can be cooked and packed hot with a broth in jars also. These pieces get packed into warm sanitized jars and with a wooded spoon. I push firmly to pack meat into the jars this removes excess air gaps and fills the jars full. You need a one inch head space in the jar to prevent the natural juices from leaking out of the jars as it boils in the canner. The fuller the jars the better it is, the nature broth will not cover loosely packed meat and this can lead to discolored meat after storage. At this point you have the option of adding salt to your meat, we add 1 teaspoon per quart of meat. It is not a necessary item but does make the broth and meat more flavorful so we choice to use it. The next step is to clean the lip of the jar and make sure no salt or meat residue remains on jar to prevent the lids from sealing. 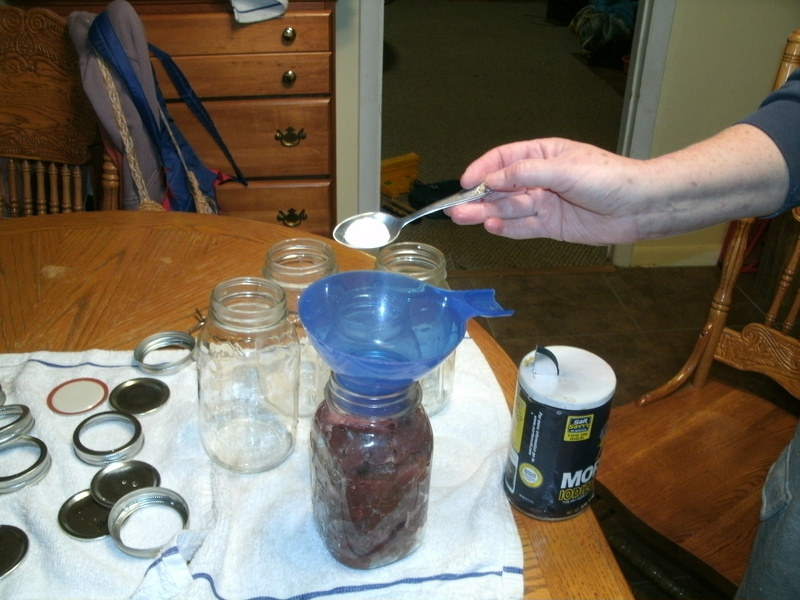 Then add the lids and seal to jars and place them in the canning with enough water to cover the jars by at least one inch of water. Then cover the canner and start a high fire. Venison is canned at 10 lbs of pressure for 1 hour and 30 minutes making it take around 2 hours total. The first 30 minutes is for the heat to raise into the canner to reach 10 lbs pressure. I usually let my canner cool over night so the cooling process doesn’t interfere with use of my stove. In the morning the jars and water are still hot to the touch but ready to remove from the canner. At this point the jars are cooling and I check to make sure all the seals are tight and each jar is clean. I usually risen them before adding the name of the contents and date. I usually process at least two deer every year this way and this gives us security that even if the power goes out we will have fresh safe meat to eat. Don’t be surprise that after you jars have cooled even further that a small amount of fat appears in the jars. It is not seen when the jars are warm and slowly forms on the top of the broth. It is totally safe and not going to spoil. The fatter the meat the more fat will form in the top of the jar. 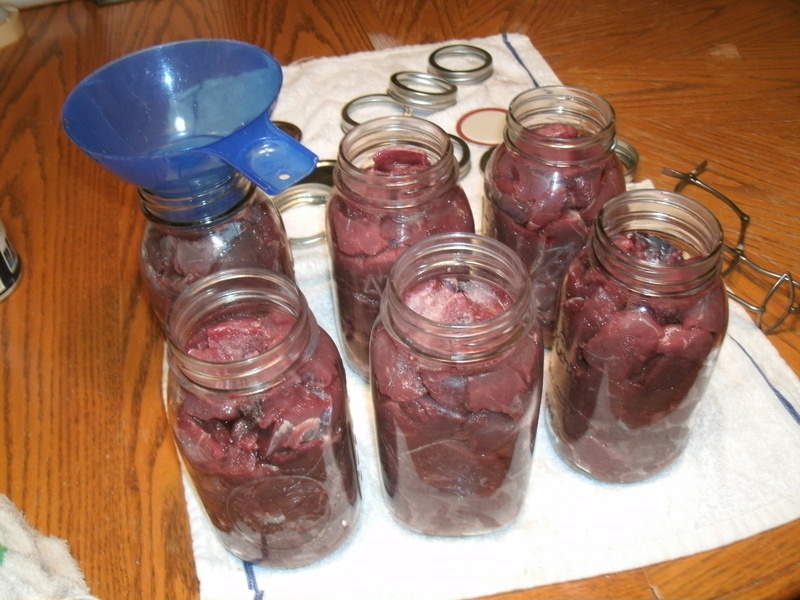 In this case venison is very lean and usually less than a teaspoon of fat collects in the jar after canning. This process is the same useing beef or pork. The only changes that are made are for cooked meats and stews or soups. That is when you really love having your “Ball Canning Guide” so that every thing is safe and healthy. Another reason to support hunting and those who choice to live off the land. My family is full of outdoors people. Eating of wild game and sharing it with others is our way of life. This program is another way for all of us to give back to the communities where they live, work and hunt. Hunters Helping the Hungry (http://www.wvdnr.gov/Hunting/HHH.shtm) is a non-profit state program that helps feed thousands of the homeless and low-income families in our area. Hunger affects the elderly, the homeless and children the most and this is one way our family is able do what we love and make it a little easier for someone in need all at once. 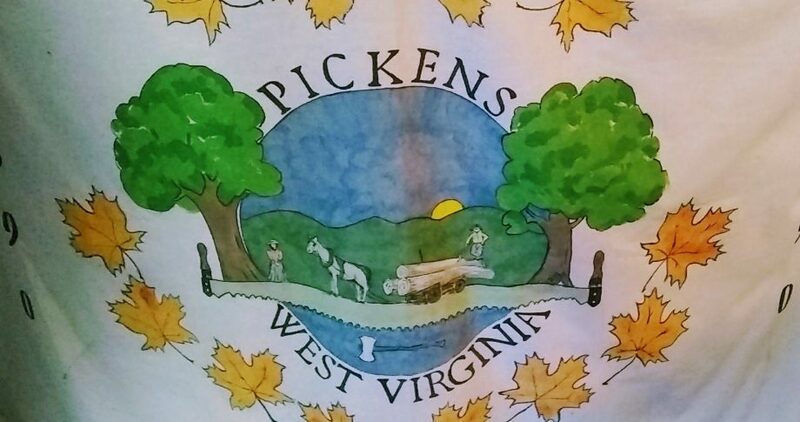 Tomorrow is opening day for Deer Bow Season and my husband along with thousands of others in the state of West Virginia will head out before day break to get the frist venison of the season. It is while I they hunt that I gear up to donate a couple of our deer this year and help in the distribution of the product to our state-run food pantry. It is our way of sharing our bounty with those who can not get out and feed themselves. 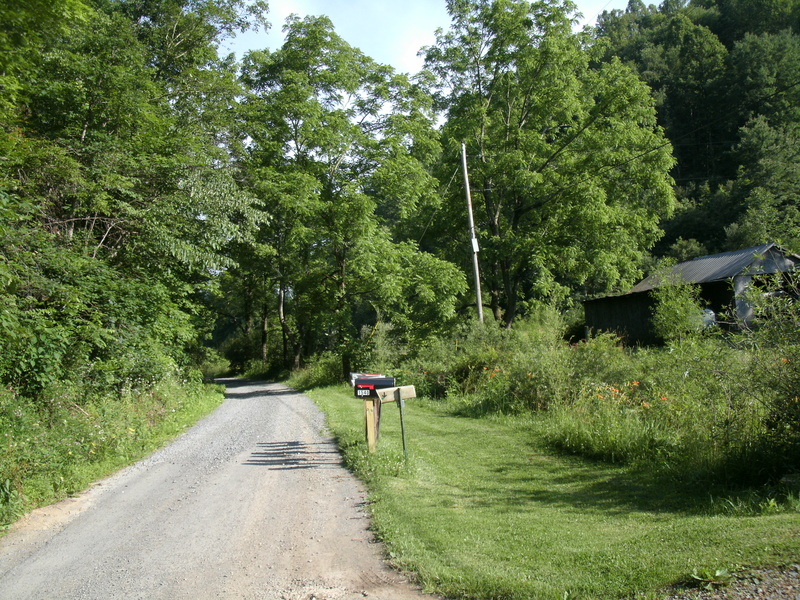 WVDNR Wildlife Resources, 324 Fourth Ave, South Charleston, WV 25303. Please think of your ability to hunt for food as a gift like we do. We share our love of the wilderness with everyone we can. I feel it is my responsiblity as a hunter and a cook to help in any way I can to make sure that the families in my community have hearty healthy meals that they can count on in the winter. 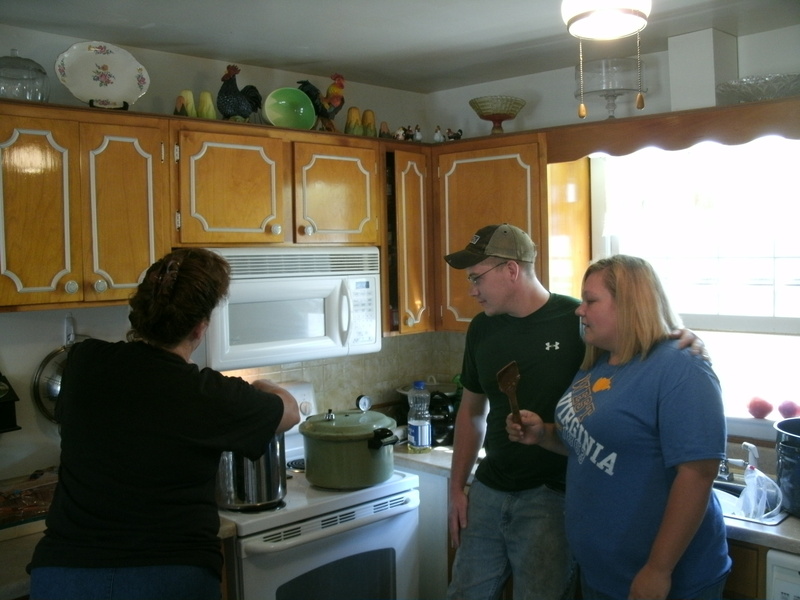 A hot-pot of venison vegetable soup can go a long way making life better for a child and adults alike. I am lucky I can make a difference by just doing what I love… CAN YOU ? Please think of who you can help with your love of hunting in the State of West Virginia and donate to Hunters Helping the Hungry.